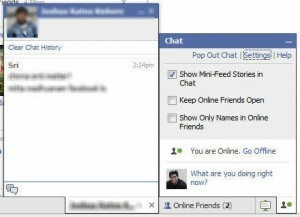 Facebook Chat: Is It Really Going to Be Better? The good news: We’ve already made progress, and we’re taking some more big steps in the coming weeks. For example, in the past couple of weeks, we’ve already made Chat faster and more stable, fixed bugs and improved the technology on which it runs. We know you want Chat to be hassle-free and uninterrupted. In the coming weeks, we will be making important improvements in the way connections are established and messages are sent, so that Chat will be much more stable for you and your friends. The biggest improvements come from changes that aren’t supported on older web browsers. After evaluating the alternatives, we’ve decided to make rapid improvements and provide the best Chat experience possible, which means we will no longer support Internet Explorer 6 browsers. I don’t know about you, but I haven’t really seen any improvements in the past couple of weeks. It’s not any worse, but it’s not any better either. Still, if Facebook wants to keep their users happy, they definitely will work on this feature. In the meantime, if any of you are still using IE6 (I highly doubt it), then you have a couple of weeks to switch. The big question remains: will this move really make Facebook Chat better for all of us (regardless of the browser being used)? You tell me.